In November 2007, an old Japanese home that stood for over 140 years in the suburbs of Kaga was transplanted to the Echizen shores to begin a new life. With its shiny black pillars and beams, this old home is full of traditional style. We have added our omotenashi hospitality to this home and welcome you to join us for a stay. There are a total of 6 guest spacious guest rooms full of the nostalgic scent of tatami mats. From the rooms that face the ocean, you have a view of the raging winter ocean waves. In the summer, gaze out at the fishing lure fires that sway in the distance. When it gets cold, we provide all guest rooms with a kotatsu to keep you warm. Relax and recharge in your room as you listen to the seabirds and the sound of the waves. 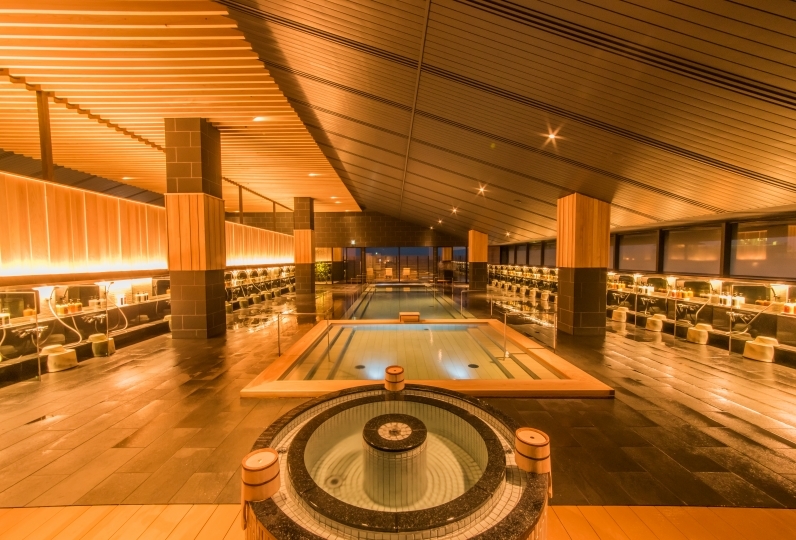 Our large communal bath is filled with 100% hot spring water from the Echizen Kuriya Onsen. You can enjoy soaking in the bath 24 hours a day. Take a soak in our natural stone bath and melt away the fatigue from your travels. On cold winter mornings, the inn master catches his own Echizen crab. In order to provide the best tasting, piping hot crab, we boil the crab for our guests right at dinner time. The freshly boiled Echizen crab is excellent. We also prepare crab sashimi, grilled crab, crab hot pot, and crab porridge to highlight all of the flavors of the Echizen crab. 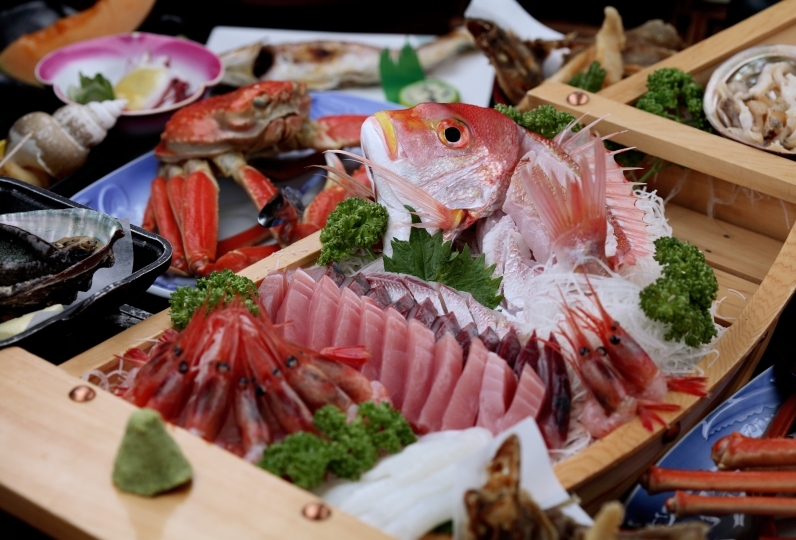 In addition to crab, we also offer fresh fish caught that day prepared sashimi style, grilled, or fried. We offer a large assortment of seasonal dishes that you may not even be able to fit it all in. We have also put in a lot of thought and effort into our breakfast offerings, providing dishes such as freshly caught squid somen and monk fish hot pot. Enjoy a filling meal that is full of seasonal, gourmet ingredients. 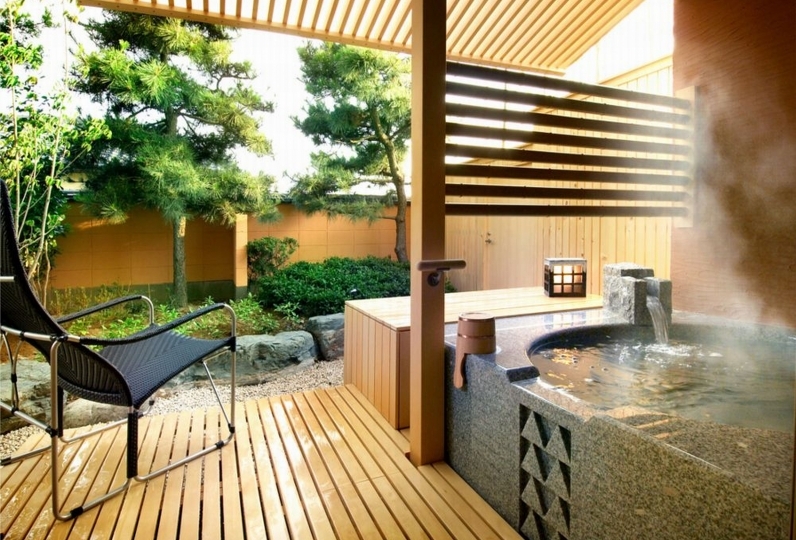 Come and join us at Ryoriyado Yamazaki where you can enjoy a luxurious stay along the Echizen shoreline and experience the many seasons of the ocean. We are located a one hour car ride from the train station. Our dinner lets you fully experience the treasures of the Echizen ocean. Enjoy the flavors of Echizen as you try fish caught from the fixed nets and dragnets that very morning, prepared sashimi style, grilled, or fried. Dining location: In-room (depending on the number of guests, it is possible that your meal will be served in the dining hall instead). Using local Echizen fish, we serve our version of the 「fisherman's breakfast」. After both dinner and breakfast, we  provide complimentary coffee in the lobby. Take your time and relax after your meal. 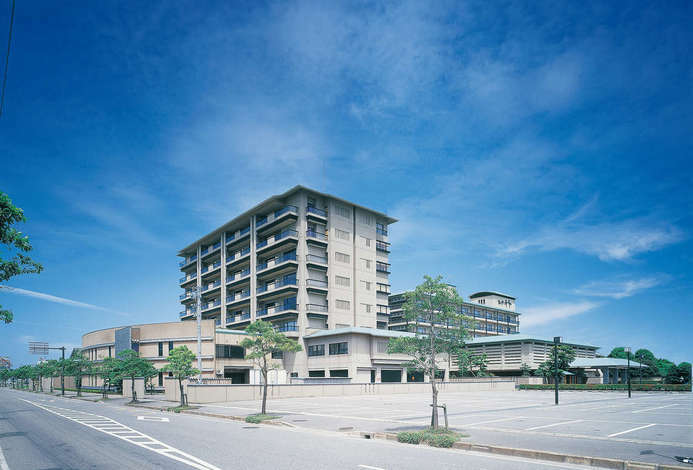 Ryoriyado Yamazaki is located, is one of the leading fishing cities on the Japan Sea side of the country. The fishermen here use a wide variety of fishing methods, including fixed nets, drag nets, and squid fishing. This results in a wide variety of fish being caught each season. At Ryoriyado Yamazaki, we own the right to catch fish independently and are able to catch the freshest fish in Echizen without going through any middle men or fish markets. While our bath is not drawn directly from the spring, you can enjoy the beautiful scenery from the window. You can view the crimson red sunset reflecting off of the ocean or gaze at the fishing lights that line up in the horizon. During the winter, look out at the rough waves. During the spring, see the calm ocean. Enjoy the different scenery that each season brings. ※The bath is available for your use from check-in until check-out. There is shampoo, conditioner, and body soap available in the shower area. Please contact the inn directly for detailed information. In November 2007, an old Japanese home with over 100 years of history was moved from its suburban location outside of Kaga and was reborn into a new traditional inn named 「Ryoriyado Yamazaki」. The wood structure, fixtures, and antique features were preserved to maintain its character. Combining our over 100 year history of omotenashi service with the charm of this old home allowed us to win the 【Good Design Award】 in 2010. Come stay with us and experience the comfort and warmth of the old wood in this traditional home as you enjoy the delicious flavors of Echizen. accommodate you if you arrive before that time. dining hall. Depending on the number of guests, it is possible that you will be served in a private dining area instead. primarily on seafood. Our cuisine is not authentic kaiseki cuisine, it is rather 「simple, countryside  seafood cuisine」 that highlights each fresh ingredient. From the JR 「Takefu Station」, take the Fukutetsu bus (going towards Kareisaki) for about 70 minutes. Get off at the 「Kuriya」 bus stop. Walk about 150m in the same direction as the bus and you will reach the inn. Take the Tokaido Shinkansen 「Hikari」 from the JR 「Tokyo Station」 to 「Maibara Station」(Shiga Prefecture). At Maibara Station, switch to the Hokuriku Main Line 「Shirasagi」 Limited Express and get off at Takefu Station. ※Please be aware that the 「Hikari」 often does not stop at Maibara Station. Take the Tokaido Shinkansen from the JR 「Nagoya Station」 to 「Maibara Station」. At Maibara Station, switch to the Hokuriku Main Line 「しらさぎ」 Limited Express and get off at Takefu Station. The 「Thunderbird」 Limited Express from the JR 「Osaka Station」 towards Kanazawa・Toyama runs about every 30 minutes to an hour. 5 of people have viewed this page within the past 24 hours.